Please read first post first! Is patch 17 solving the Flsgard castle crash in Ch.4 ? I have the same problem as mentioned before, playing on the real Saturn. The fix earlier posted seems to be gone. The fix posted earlier was indeed incorporated into V17. If you aren't using V17, you should definitely get the latest. I hope this is the sort of thing you're after in this thread! 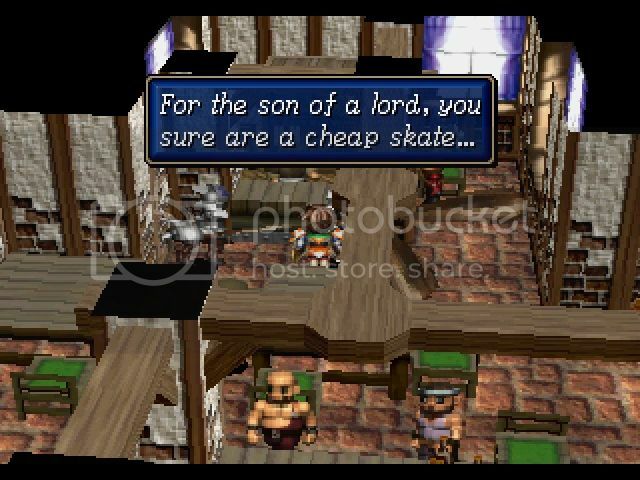 Just playing through the v1.9 patch of scn 1 and spotted this typo! In the scene just after the Railhead Switchpoint/Refugee battle, Masquirin says schickens and chickens in the same speech bubble! Darksol @ Sat Sep 08, 2007 3:02 am wrote: You have fallen from the path of righteous drunken adventures and now find yourself seeking cheap thrills at the expense of your pride. Remember, for a drunken adventure to be glorious, it cannot be scripted. And it certainly cannot be sewn. Yes, this is so controversial there are whole threads about it. It is intentional (and in the original release, btw). She is excited and rushing her words. She is correcting herself in the line. Cool, no worries! You know, I've played scn. 1 through so many times, and I've never even noticed it! I’ve just cleared the catacombs battle using version 19 and the game is crashing afterwards. It’s during the dialogue when the music changes to the sad music. 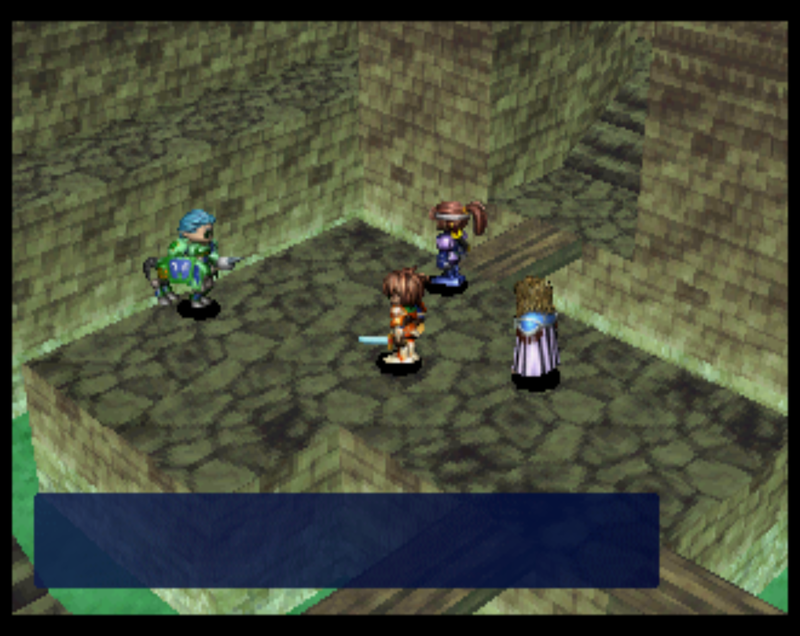 If this is in SSF, it's likely more related to the emulator. There are several "crash points" in the game that if your computer is underpowered and/or the settings are set too high, it will crash. Try going to EZ Settings and setting it to the Fast/high compatibility option and try the sequence again. Once passed it, return the settings to normal. If this is on real hardware, I will investigate further. Thanks for the reply LF. You were right, I was able to get the crash point by reducing some settings on SSF. Yeah I finally got a crash after battle 27, during the dialogue right when the music change from the creepy music to the sad music, the music is still playing when this happens, and I can still load states and rewind the emulator. I'm not using SSF though, I'm using Mednafen through the launchbox app. I'll post a screen of when it happens and my mednafen settings. ;Enable BIOS ROM image sanity checks. ;Enable CD (image) sanity checks. ;Character encoding for the debugger's memory editor. ;Enable (automatic) usage of this module. ;Enable multitap on Saturn port 1.
;Enable multitap on Saturn port 2.
;Attempt to auto-detect region of game. ;Enable scanlines with specified opacity. ;Force interlaced video to be treated as progressive. ;Transparency of otherwise-opaque mask areas. ;Last displayed scanline in NTSC mode. ;Last displayed scanline in PAL mode. ;First displayed scanline in NTSC mode. ;First displayed scanline in PAL mode. ;Automatically set RTC on game load. ;Enable specified special video scaler. ;Enable video temporal blur(50/50 previous/current frame by default). ;Accumulate color data rather than discarding it. ;Blur amount in accumulation mode, specified in percentage of accumulation buffer to mix with the current frame. ;Scaling factor for the X axis in windowed mode. ;Scaling factor for the X axis in fullscreen mode. ;Scaling factor for the Y axis in windowed mode. ;Scaling factor for the Y axis in fullscreen mode. I noticed SSF settings, I'll post those too, even thogh I'm not sure if it matters. Its being invaded by the Otherworld. A world of nightmarish delusions come to life. My youtube channel of terrible video game talkthroughs. I don't know anything about other emulators, but I would still assume it is a product of emulation. I would also assume you could lower the settings and get past it, but I have no experience with this working in other emulators. Save states are to be avoided in SSF (again not sure how stable they are in other emulators). The majority of people I've seen experience crashes are actively using save states. It appears that contributes to the crashing. There is even evidence that if you load a save state and make that your save moving forward, that you will have crash problems for as long as you use that save line. In other words, you never want to use the save state function for normal play (as opposed to testing). 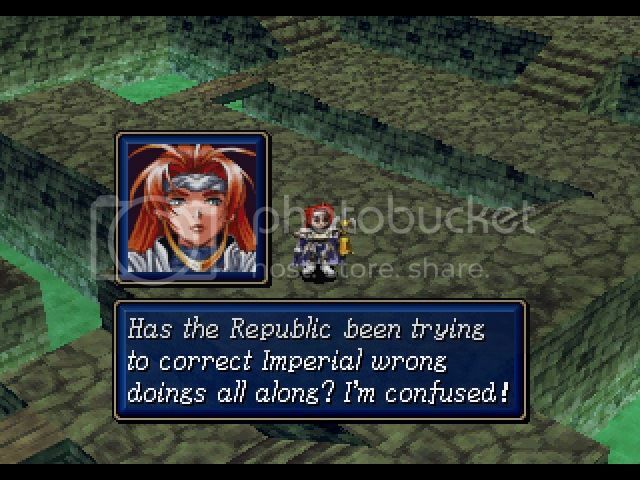 Arc_the_Lad wrote: Yeah I finally got a crash after battle 27, during the dialogue right when the music change from the creepy music to the sad music, the music is still playing when this happens, and I can still load states and rewind the emulator. Yeah, this is the very spot I had my crash. I'm not familiar with Mednafen but hopefully you can still get past it by changing some settings. Hope this helps you get past. Not sure if this is the correct place to report this, but the Inspect menu in the overworld seems to stop displaying the scrolldown arrow one element sooner than it should - this is viewable on a new game as soon as you leave the starting building. opening the Inspect menu won't show the down arrow, but you can scroll down one since you have four members in your party, and upon scrolling down the scroll up arrow appears. i first noticed this later on in the game upon reaching Vagabond, so it seems like a simple counting error. this bug is not present in the japanese version since it displays four units at a time in the menu, not three. This is an error in the game code and we have no control over it. Thanks for taking the time to submit! If you look at my past broadcasts at twitch.tv/borgsrpgquest today, january 24th 2019, i had maybe eight total CD READ ERRORS in hours of streaming. this hasnt gone well for disc 1 at all. a streamer should not ever have a freeze or read error. should i get better burning software and burn at 1x speed or is it something else? 230am update edit: I can retract my statements for now, because burning it at ultra slow 1x (rather than 4x) has given me a disc that is extremely good. All are welcome to watch one of the RPG greats in my channel nightly!!!!! THursday update: its back to saying CD READ ERROR but still lets me play. the annoying message is bad. CD read error is still a massive problem, even having burned disc2 for the first time. the CDR's are MEMOREX, and the software is IMGBURN. very slow speed burning. CD's are a thing of the long past, and no stores have good brands now. I have same problem with CD READ ERROR.. This can happen even with factory pressed discs the more years a Saturn laser has behind it. Check the height of the spindle to make sure the disc is spinning free and bump the laser strength up for burned discs. They are much harder to read. The good news is if your disc is spinning and loading and playing with only occasional freezes, you probably just need a tiny bump in laser strength to set it right. This video is one of many on the subject on YouTube. Greetings! For anyone who remembers me, I'm just dropping in for my approximately five-yearly visit to SFC. I completed a quick playthrough of the most recent version of scenario 1 (skipped talking to most NPCs). It's looking most excellent, but I spotted a few minor typos/spelling and grammar issues which I hope will help. Correction: All we've established is a corrupt bureaucracy. 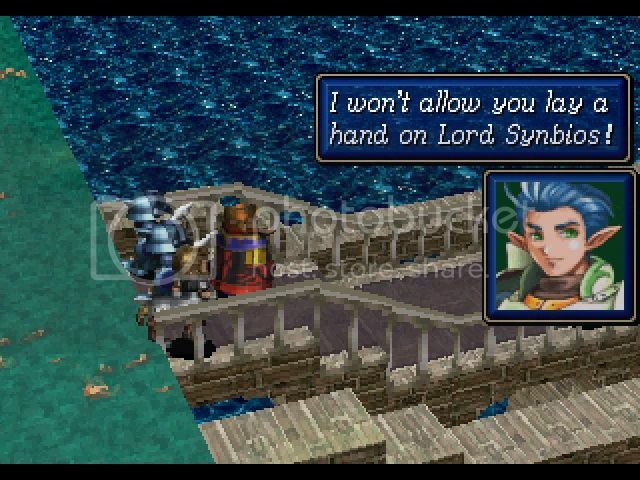 Correction: I won't allow you to lay a hand on Lord Synbios! (Is this replicated in the same scene in Sc2 and 3 as well?). 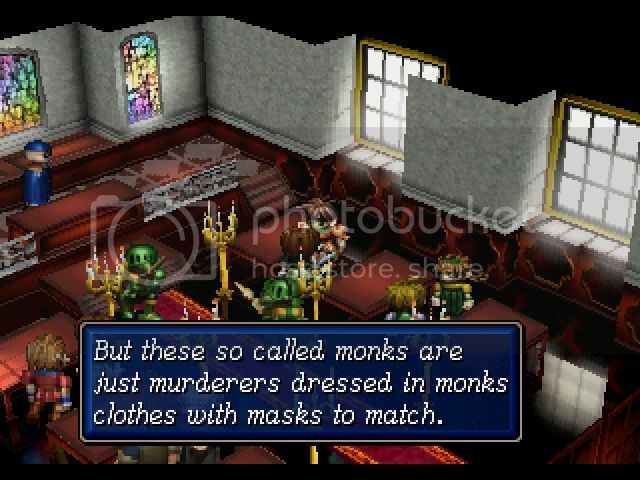 NPC in Flagard Church following Conrad's death: "So-called" should be hyphenated, and there needs to be an apostrophe after "monks'". Speaking to Spiriel after the Catacombs battle: "Wrongdoings" should be a single word. 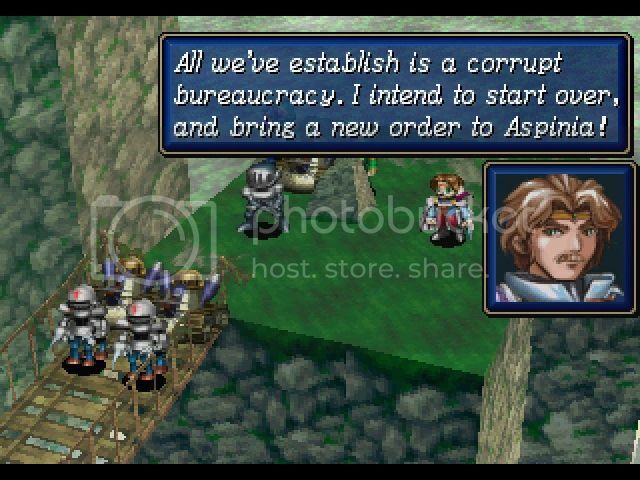 Malorie, speaking to the mercenaries at the end of chapter 6: "Cheapskate" should be a single word. I also wanted to suggest a possible correction to a couple of the sentences in the final chapter summaries at the end of chapter 6, which are not quite grammatically correct. "Hostage against Malorie's aggression" seems oddly phrased and the tenses change - all of the other chapter summaries are written in past tense so I suggest sticking to past tense with this one as well so it doesn't read strangely. 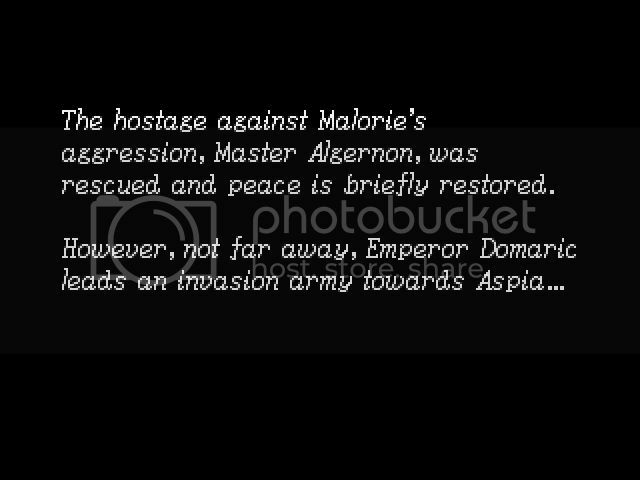 Suggested correction: "The hostage preventing Malorie's involvement, Master Algernon, was rescued, and peace was briefly restored." 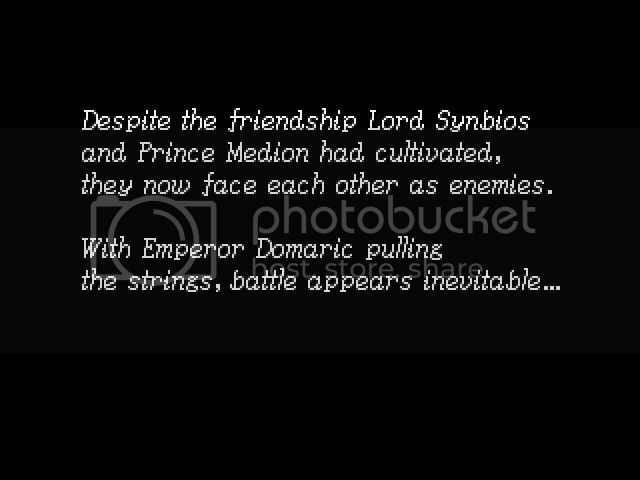 "Despite the friendship Lord Synbios and Prince Medion had cultivated, they now faced one another as enemies. With Emperor Domaric pulling the strings, battle appeared inevitable..."
I'm currently playing through Sc2 and 3 with a friend who has a background in linguistics and she's great at catching things like this, so I will have some detailed feedback about those too. And thank you to everyone who's worked hard to bring the patch to this standard. It's very impressive, and you are all awesome! Great to hear from you, Athrades! Great catches, all of them. Thanks for taking the time to document them! I got them fixed up. And yes, the hero meeting line was in error in all three scenarios. The one thing I didn't change was the last screen of the chapter 6 ending. There is an intentional shift to present tense in this line so that the cliffhanger is in the moment. Thanks for this and l look forward to seeing what you catch in the other scenarios! You are most welcome and I'm glad they helped! That's perfectly reasonable for the final summary line as long as it's intentional. I'll be back with sc2 shortly. Thanks so much for all your magnificent work, LF!